'Karthigai' is the festival of South Indians when girls / ladies light lamps and offer puja for the welfare of their brothers. It falls on Karthik Purnima between 15 November and 15 December - usually on Guru Nanak Jayanti / Datta Jayanti. It is the Madrasi equivalent of the Maharashtrian 'Bhau Beej' or the North Indian 'Bhaiyya Dooj' or 'Raksha Bandhan'. Festivals in South Indian homes too mean fast/puja for the elderly, specific delicacies for the children and an extra ton of work for the home-maker. This 'ton' includes preparation - for 'naivedhyam' (offerings for the deity) and puja - and it starts one day before - like grinding / powdering rice, procuring puja items like betel leaves, flowers, tulsi leaves, mango leaves, fruits.., making a nice big 'ma kolam' (rangoli with ground rice) at the entrance of the house. Getting back to 'Kaarthigai', the delicacies for the day are 'appam', 'pori' and 'adai'. In non-Metro cities, in non-Madrasi-infested areas, we have to procure 'malar pori' ('laaya' / puffed rice / nel pori) during 'Diwali' when it makes its special appearance in the shops and spend some 20 minutes cleaning it - separating the husk - including the ones still sticking to it like a leech. As for the other variety - 'aval pori', you have to just clean off the dust. Other preparations include bringing out the brass and earthen lamps of all sizes and shapes, and cleaning them to a sparkle. And then dry them and put oil and wick in them the next day. After all the preparations of the previous day, you'll have your hands full on the D day. Grinding rice and jaggery together for appam, grinding rice and lentils coarsely for adai. Grinding a handful of rice for 'kolam'. Preparing jaggery syrup to the right thick consistency and adding one variety of 'pori' to it along with coconut pieces. Since this is an annual delicacy, you may not hit the right consistency for the syrup. But definitely the second variety of 'pori' that you make will be a better accomplishment. Don't worry, the family will finish it all up in no time! The morning will be consumed by all these activities. A tip to make the morning less action-packed - make the 'pori' varieties one day earlier. Reserve the afternoon for 'kolam' - it's the best time because that is when movement in and out of the house is at a minimum - so the 'kolam' gets to dry without getting stepped on unawares and marred. Then another flurry of activities - making the 'appams' and 'adais' for the 'naivedhyam' and setting them in front of the deity along with the 'pori' varieties, betel leaves, fruits, water, flowers - all in readiness for the puja at sunset. When the kids get back from school, they'll come sniffing their way to the delicacies threatening to eat them even as you try to shoo them away explaining they are for 'naivedhyam'. I remember my sons issuing me an ultimatum that pujas be performed by 5.30 pm - that was when they'd return from school - so they'd not be put on the patience-testing 'waiting mode'! 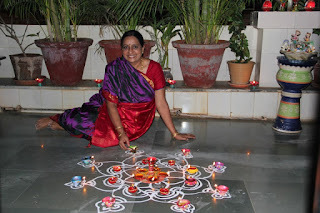 You can distract the kids and enlist their help by asking them to help you in arranging the lamps around the 'kolam' at the entrance and all along the railing in the terrace. Next you have to slip into a 9 yards sari - I wish it were as easy as that - I mean 'slipping' into it! I have to admit I'm still a novice at it and walk like a 'penguin' (that's my sons' comment) and so I skip that ritual. But my younger sister Hema drapes herself in a 9 yards sari before you can bat an eyelid - see how comfy she is (see the pic above). (I heard Chennai Silks and its ilk have come up with a ready-made 9-yards-sari for the hard-pressed-for-time, modern lady.) By now it would be dusk. Light the lamps along with your kids, taking care not to get too close to the flame. Offer puja, pray for the well-being of your brothers (read siblings) - for all the brothers in this world (specially for those who don't have sisters). As you sit back with your family relishing the delicacies of the day and watching the sparkling lamps and thinking of your siblings, you enjoy an indescribable sense of joy and fulfillment. © Copyright 2011. Brinda Balasubramonian.